Wild animals love British Columbia. Of course they do – it’s varied terrain makes it a haven for beasts and creatures of all shapes and sizes. Both small and large species, from the gigantic moose to the night-crawling raccoon, pose potential hazards for drivers, and vise versa. A large animal can make a serious impact, while a smaller animal can startle a driver into swerving and losing control of their vehicle. It’s our job to prevent animals and drivers from crossing paths, and the wildlife overpass is just one of the ways we do this. Along with wildlife underpasses, which we wrote about in a previous post, overpasses give wildlife safe passage to important seasonal habitats. Healthy wildlife populations flourish when ecosystems remain connected, and wildlife overpasses help achieve that. Think of them as “wildlife freeways,” keeping animals moving while preventing collisions with vehicles. Our wildlife experts are instrumental in determining overpass locations. They work closely with bridge engineers on the design of the structures, and with geotechnical engineers on the final location. Overpasses are built after extensive wildlife habitat surveys, wildlife tracking surveys, wildlife population surveys, and analysis of wildlife accident locations using the ministry’s WARS data. Our maintenance contractors also keep the grass and brush short along the highway to allow drivers to see when any animals do come close to the road. 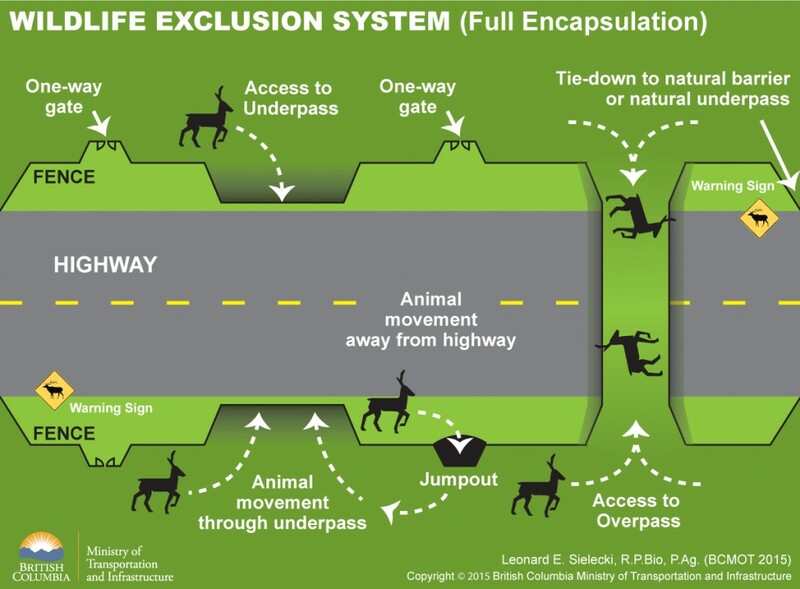 We estimate that a well-designed, well-constructed and well-maintained wildlife exclusion system can reduce the potential for wildlife collisions by more than 90 per cent. That’s good news, whether you travel on four wheels or four legs. Have a question about wildlife overpasses that we didn’t answer? Let us know in the comments section below. I would like permission to link to webcams and use your Wildlife Exclusion System diagram to show students a real-world examples of how scientists are providing solutions to fragmented ecosystems during my Global Skype Virtual Education Session: Jr. Biologists Investigate Conservation Science. I am showcasing the road ecology of work of USFWS and the US Dept. of Transportation. I would love to include Canadian science as well. The session is an exploration of how conservation biologists are using scientific tools and methods to learn about and mitigate human threats to ecosystems, ecosystem services, and wildlife communities. I am showcasing the road ecology of work of USFWS and the US Dept. of Transportation. I would love to include Canadian science as well. Hello Deb and thank you for your comment. You are free to link back to our webcams and highlight our Wildlife Exclusion System diagram, as long as the images etc. are not used for marketing/promotional/monetary gain. Please credit the BC Ministry of Transportation and Infrastructure. Thank you! Hello, my name is Tyler from Child of God. Thank you for replying to my E-mail. I would like to ask if you would be willing to do a pod cast, phone call, or other form of communication during our presentation.We will be asking the same questions that I asked earlier. I will try to keep in touch. Thank you for your cooperation. One of our wildlife biologists has been in touch with you directly and we hope that this helps answer your questions. Thanks for connecting with us here and good luck with your project. Hello, my name is Tyler from Child of God School. We are doing a project on white tailed deer. I seek answers and useful information about these questions. When people interact with white tailed deer, is it on purpose or on accident? Does the interaction help or hurt the people, animal, or both? What type of professionals work with or study animals? Do you notice any ways that the interaction could be better, more productive, healthier, or happier for both the animal and the person? Thanks for connecting with us here. Interactions with deer can be both accidental and on purpose, but because white tail deer are wild animals, the least amount of contact with humans, the better. Wildlife biologists would study these types of animals and for a variety of reasons. Hope that this helps.